The final two raised beds are both 4’x4′ square beds. In Bed 9, we are planting a ‘Cascade’ Hops vine to grow for the next few years. Hops are used for brewing beer, and we have been getting more and more questions about growing them. The young shoots of the vine can also be harvested like asparagus and eaten. The vine can grow 10+ feet per year. It is also a good food source for butterflies. 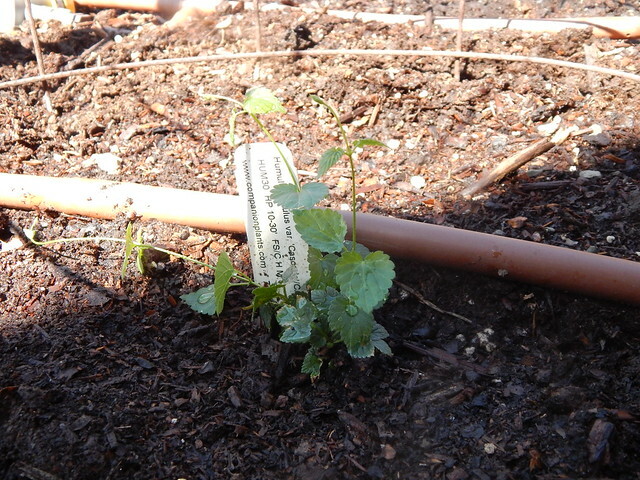 We ended up planting some caraway seeds around the hops vine as well, just to fill the space until it grows. Bed 10 is not yet planted, since the weather isn’t quite warm enough yet. This bed will feature plants from the Ginger family (Zingiberaceae). Ginger used fresh is becoming more familiar to the average American cook, but it is still uncommon in the garden due to the tropical characteristics of the plant. Other flavoring or spice plants that are in the same family of tropical include cardamom, turmeric, and galangal. These plants will also have a share of this garden. It remains to be seen if they will do much, but it will be fun to watch them grow. Posted on May 14, 2016, in Garden Planning and tagged ginger, herbs, hops. Bookmark the permalink. Leave a comment.